These are not the cakes you're looking for. Move along. Folks, this is epic. Not only is our stormtrooper friend quite tall at 6'4", he weighed a full 300 pounds before 600 geeks mercilessly ate all of his cakey goodness, which included Rice Krispy legs. (Largest. Rice Krispy. Ever.) 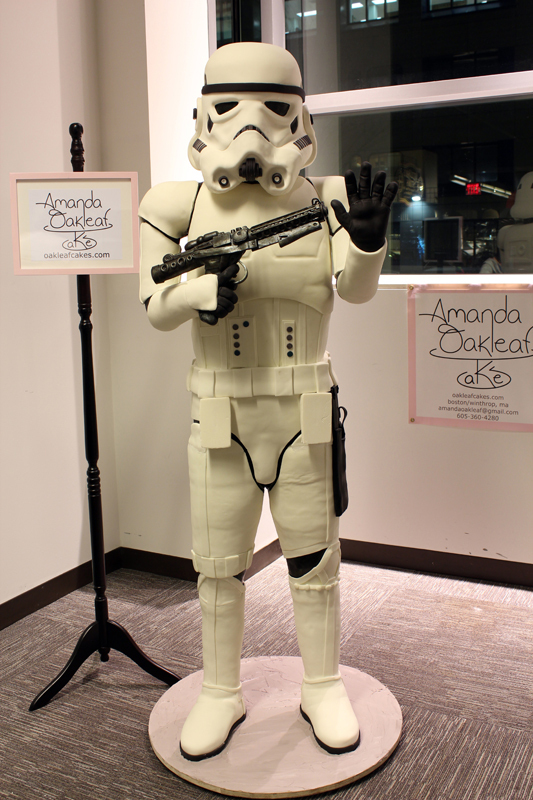 It took a team of 10 people from Oak Leaf Cakes a full two weeks to build him for the Arisia Sci-Fi Convention in Boston. Want to watch Mr. Stormtrooper devoured by hungry nerds? See: How to Eat a Stormtrooper. Never stand between a geek and her cake. I would have never guessed that this was edible!